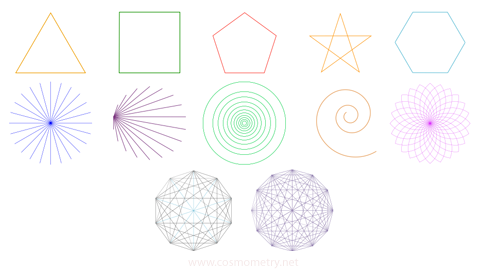 The basic means of understanding the fractal-holographic model of cosmometry is by perceiving the various patterns, structures and processes that comprise the model. In essence, these represent the 2D, 3D and 4D dimensional levels that are the minimally accepted and most easily understood components of our human perceptual framework. To illustrate the distinction between them, here are a few examples. These are two-dimensional representations of energetic arrangements and metaphysical concepualization (e.g. the 12-around-1 matrix on the bottom right, which isn't seen in nature but represents a fundamental geometric relationship such as in the 12-tone music scale). These are three-dimensional vector-based forms and systems, common to atomic and crystalline energetic arrangements, viruses, tensegrity structures found in cell membranes and muscular systems, architecture, etc. These are four-dimensional (with time being the fourth "dimension") evolving forms and systems. The fundamental form of this is the torus. Seeing these as unique characteristics of how energy can be observed to behave (physically and metaphysically) that are each a part of a whole integrated system provides a "tool set" with which we can piece the cosmometric puzzle together.